I think the story about weight loss and infrared saunas is a sales pitch. Its just another thing to add to the health benefits list. 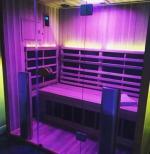 I have had an infrared sauna from www.prohealthsauna.com for about 4 years, I have never noticed any weight loss. I think if a sales person at a sauna place tries to sell you on weight loss as their primary feature, run away. I use mine for D-Tox benefits and for muscle soreness after workouts. These are my thoughts and I'm sticking to it.